Many of you are probably familiar with the classic “marshmallow experiment,” in which a young child is left alone with a marshmallow (or cookie) and told that they are welcome to eat it, but if they can resist for a few minutes the experimenter will return and give them a second marshmallow. The marshmallow experiment was meant to be a measure of impulsivity vs. the ability to delay gratification. Children who ate the first marshmallow grew up to become young adults who went to raves, robbed convenience stores, and started knife fights in prison. Children who waited for the second marshmallow later earned perfect SAT scores, got into elite colleges, started lucrative hedge funds and brought the world economy to its knees. Today CJ found a chocolate Easter bunny that her grandmother had hidden for her during a recent visit. 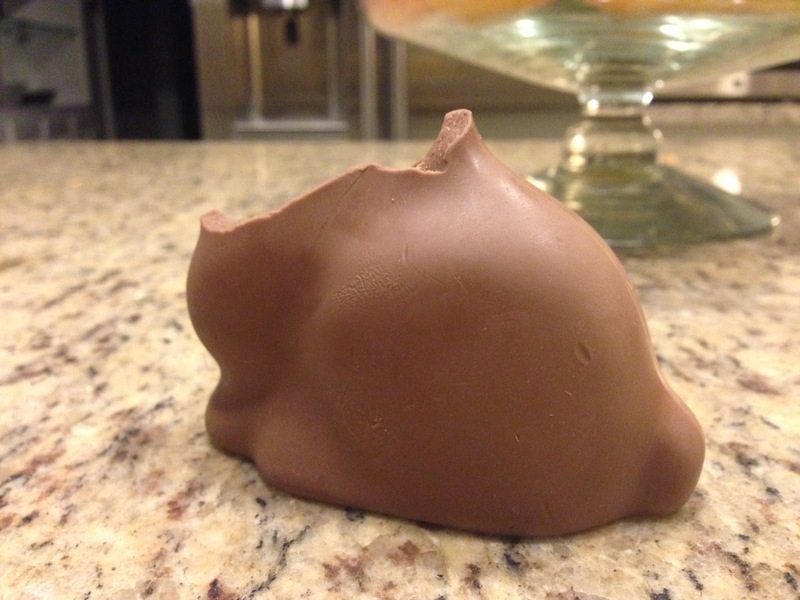 It was much too big to eat all at once, so I told her she could have one of the ears and save the rest for later. Then I told her that if she could leave the ear alone until after dinner, I would give her a second ear. CJ didn’t understand at first. She reached for the ear so I stopped her and explained the rules again. After that she did very well, munching through her cherry tomatoes and turkey while the ear sat unmolested on her placemat. She took a sip of water, said she needed to use the potty, and left the table. While she was gone I ate the entire head. I guess it's raves and knife fights for you. As for CJ, well, I guess you're going to have to buy her another bunny!